Welcome to Pigeon Forge Shopping. There are many good reasons people visit the area. Some for relaxing in the mountains, some for the entertainment and many more for the shopping. In fact, Pigeon Forge is actually very well known as America's factory outlet shopping capitol which is now the second most popular attraction! Pigeon Forge Shopping has well over 200 factory outlet stores in six separate major outlet centers. If you are looking for a shoppers paradise you need not look any further. You can find bargain prices on clothing, jewelry, athletic equipment, home furnishings, housewares, tools, shoes and much…much more. But that’s not all. Pigeon Forge has some amazing shopping center areas, combination shopping and entertainment areas, unique old nostalgic turn of the century shopping districts and some of the most unique one of a king specialty theme shops you’ll find anywhere. This is your opportunity for buying and saving on purchases of your favorite brand names direct from the manufacturer at the best advertised price. The Tanger Outlet is a one-stop shop with over 100 stores to choose from in one location! To see more information click here for Tanger Five Oaks Outlet. Z-Buda Outlet Mall…what a catchy name!! This was one of Pigeon Forge shopping first outlet malls in the Smoky Mountain area. It is host to over 30 name brand stores and even has a restaurant and a place that kids can call home for a few hours…an arcade! The Z-Buda Outlet is located on the main Parkway in Pigeon Forge. It is one of the older shopping outlets, but it is very clean and well organized with a lot fine stores. Shops in the Old Mill Square area offer handmade crafts, hand thrown pottery, wood crafts, clay sculptures, jewelry, hand-carvings, weaving, great southern style cooking and various other unique items throughout the area. Click on Old Mill Square to see and read more thorough Pigeon Forge shopping information. 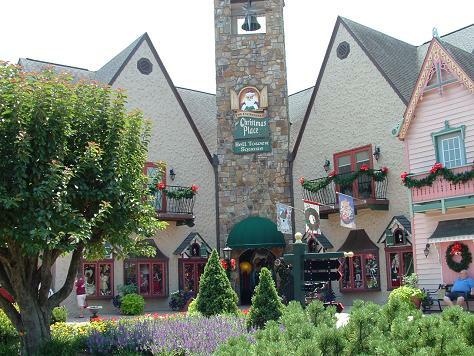 The Incredible Christmas Place looks like a Bavarian village and is known as one of the top ten Christmas gift and specialty shops in the country. Click on The Incredible Christmas Place to see and read more thorough Pigeon Forge shopping information.